100M bit/sec links allow teleworkers to run high-bandwidth applications. Reykjavik, Iceland, likes to set records. In April 2003, the world's first public hydrogen fuel station opened. The world's largest geothermal system heats houses and even streets. Now Reykjavik is trying to become the first city in the world that delivers fiber to every home. Since installing a fiber-optic backbone network four years ago, Reykjavik Energy, a city-owned utility, has connected 500 electricity substations with fiber and has begun running fiber from substations to homes. After a 100-home trial that began last year, the utility's goal is to connect 4,000 homes this year, 15,000 homes in 2005, and all 65,000 Reykjavik homes within five years. "We have a very short connection point to customers," says Thorleifur Finnsson, Reykjavik energy's director of business development. "It's not a last mile. It's a last quarter mile." While universal residential fiber connectivity sounds daunting, Finnsson says his company has an extensive network of underground water pipes and electrical cables running to homes. As the utility performs scheduled maintenance on those cables, workers will lay underground fiber. This will substantially reduce the need to dig up the ground strictly for fiber installation. During the trial last year, Reykjavik Energy provided 100M bit/sec connections by installing a customer premises switch from Swedish company PacketFront in each participating home. The wall-mounted switch connects to the fiber on one end and provides eight Ethernet ports on the other end. Four of the ports are used for an IP set-top box, two for Internet access and two for "general purpose." While the trial has used several brands of set-top box, Reykjavik Energy is considering standardizing on a box from Amino Communications that uses one IBM Vulcan chip. A Reykjavik consulting company called Industria is providing the Self-service Portal user interface. The software displays services available on the network, including video on demand, IP telephony, networked security systems and Internet services. While Reykjavik Energy is reluctant to discuss cost projections, Industria estimates that running fiber to every home will cost a minimum of about $1,250 per installation. This figure includes about $475 for "active" costs, including switches, routers and premises equipment, plus another $775 per customer for "passive" costs that include pipes, cables and labor. Reykjavik Energy pays for the installation costs. Reykjavik Energy provides the infrastructure, while partners deliver the services. "Our network is open to all service providers. The customer activates each service and pays each service provider directly," Finnsson says. "That's the beauty of it." Once a customer activates any service, the utility charges a fixed monthly fee regardless of the number of services used. The utility also receives revenue-sharing from service providers. The initiative lets businesses extend the workplace into employees' homes. Stefan Gudjhonsen, CIO of Air Atlanta in Reykjavik, participates in the trial and uses his connection for high-powered telecommuting. "There is no difference between that connection and sitting in my office, even if the application has an intensive datastream," Gudjhonsen says. From home, Gudjhonsen runs bandwidth-intensive applications, including aircraft parts management and maintenance scheduling. "That program runs 1M bit/sec for a single query. With my 100M bit/sec link, it takes 30 seconds. A DSL connection will not do well for this." Gudjhonsen also uses an IP home telephone that ties into the corporate network. With fiber to the home (FTTH), employees can participate in meetings from home via DVD-quality videoconferencing, in live and stored training sessions. Conversely, employees at work could view and interact with children at home. "You can create an environment in which the home office is an identical environment to the real office. So it's a benefit to everyone...less real estate for employers, more flexibility for employees," Gudjhonsen says. "It should be lucrative for companies to have employees' [homes] connected because they will get more out of them." The ability to send and receive DVD-quality video is key to extending the workplace into Reykjavik homes, and there already have been efforts to demonstrate the potential of video applications. Gudjon Mar Gudjonsson of Industria, the company that designed the user interface, is a participant in the trial. "In three hours, I was able to install a TV station in my home at a cost of $800." The setup includes an MPEG2 codec and a free Microsoft Windows Media 9 encoder. Using IP multicast technology, users can "broadcast" citywide or to specific viewers. While Gudjonsson has so far only used his "TV station" for demonstrations, he sees benefits for corporations. "You can have a DVD-quality videostream between workers on a team, and the quality is perfect at a very low cost," Gudjonsson says. "You can buy the equipment at Radio Shack." Security is an obvious concern. A Reykjavik systems integrator specializing in financial services, 24T, is developing a telebanking service for the FTTH rollout. The service includes two-way audio and one-way video from the bank's call center so that video tellers can help customers complete transactions. "When you take a multicast stream into the bank's network, we have a problem with the firewall," Halldor Axelson, CEO of 24T, says. "Cisco has finally shepherded this type of traffic through the firewall by something called multicast VLAN registration or MVR." MVR lets a subscriber on a port subscribe or unsubscribe to a multicast stream. 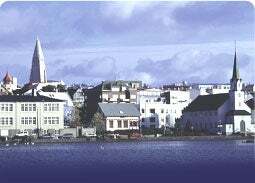 Reykjavik Energy is confident that FTTH will be successful. Says Gudjonsson, "In 10 years, selling an apartment without Ethernet will be like selling an apartment without electricity." Rosen speaks on communication topics and is chief strategist of Impact Video Communication. He can be reached at erosen@impactvid.com.